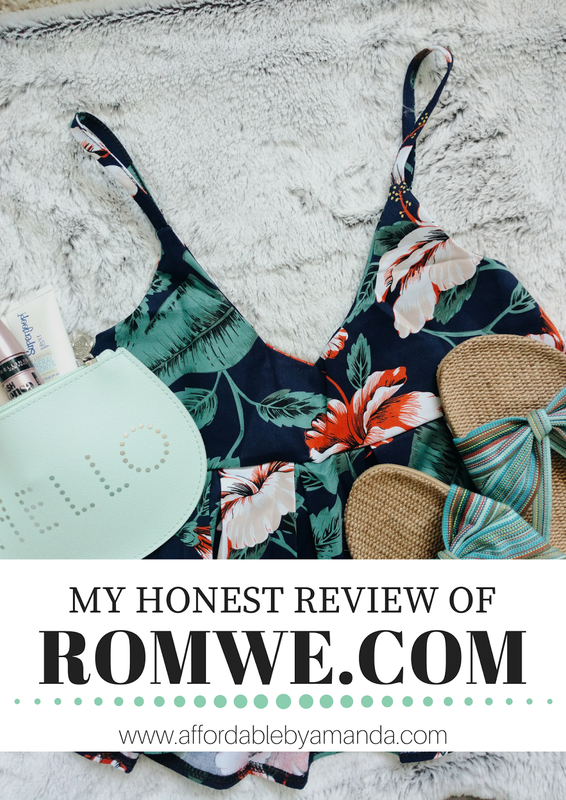 Affordable by Amanda: Romwe Review: Was It Worth It? Romwe Review: Was It Worth It? I first discovered the online clothing retailer Romwe through one of my favorite YouTubers, Danielle Carolan. She purchased quite a few items from Romwe and reviewed them all by trying them on. In my opinion, they all looked legit, as I was skeptical about ordering from an Asian retailer. I browsed the website one evening any slowly added more and more pieces into my shopping cart until I was nearly up to $50, which qualified me for free shipping to the USA! I chose all of the following items that will be discussed in my thorough review and sent over my shipping address that same night. I was eagerly anticipating my package for a few days, until that slowly turned into a few weeks! So, here are my pros and cons to the pieces that FINALLY arrived in my mailbox after nearly a solid month of waiting! 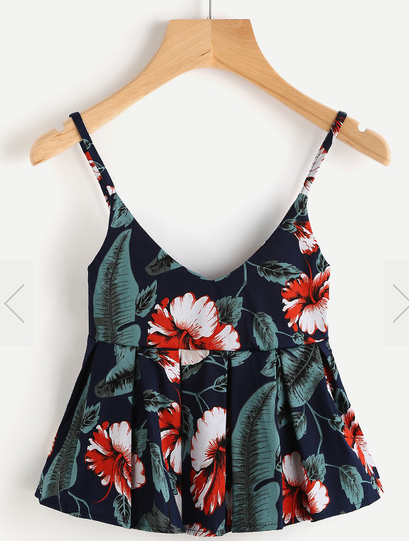 What attracted me to this tropical cami top was the print. I loved how summery it looked and how the print reminded me of vacation time! The price was reasonable, too. I purchased this top for under $7.00 and to me this one was a WIN. This cami apparently comes in tons of colors so I may even buy myself more! PROS: Material feels nice, not cheaply made. I don't need to wear a bra with it so that's a plus! Perfect lightweight summer top.CONS: Very tight fit. Won't work at ALL if you have a large chest, because this cami comes in just "one-size". GIRL POWER!! I absolutely love this t-shirt not only because of it's appropriate message, but for it's cuteness that is combined with delicate tears all over. I consider this t-shirt a WIN, too. The material is polyester but it's not too itchy. The shirt also looks exactly like the picture, so I appreciate that factor when ordering online! PROS: Easy to wear t-shirt, fits like a medium on me. CONS: Nothing! I really love this item. I wore this top in my latest blog post, and I have wanted to own a pretty light blue and lace top for some time now. This top, like most of the ones found on Romwe, is also one-size! The price point was OK, I wish this top was just a little cheaper because when it arrived I felt mixed reviews on it after the fact. PROS: Lightweight material. Matches well with a lot of items I already own. CONS: One of the biggest cons to this top is the spaghetti straps! They kept falling off my shoulders while I was shooting this outfit look. The top also wrinkles super easily so I needed to steam it before I wore it out. Overall, I plan on wearing it again, I just wished the sleeves weren't so loose. Danielle Carolan from YouTube owns this EXACT set so I knew I had to love it when I bought it. 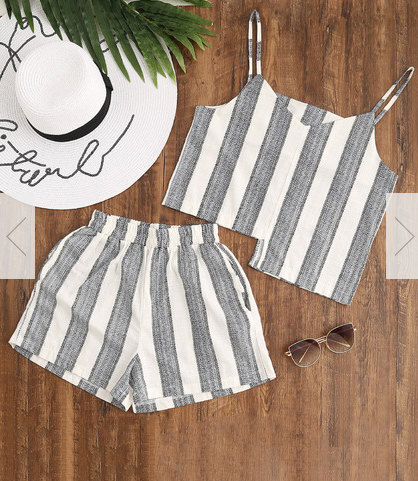 The stripes are what I loved about this set because I wear that pattern religiously, especially during the hot summer months. When this set arrived, I tried on the shorts and found pockets on them, which made the shorts a majorrrr WIN. However, at least in my personal case, the top is way too big for me and that part of this set is a FAIL. PROS: Love the shorts! I already wore them out and about and have an outfit planned to hit the blog soon with them on. CONS: The top. It is HUGE! I won't be able to wear it unless I get it altered and taken in, which is a bummer. I would say my experience with Romwe was mixed. I had to wait a long time for my clothes to arrive, which I understand because they were coming from such a long distance, but I still wished they were in my hands sooner. 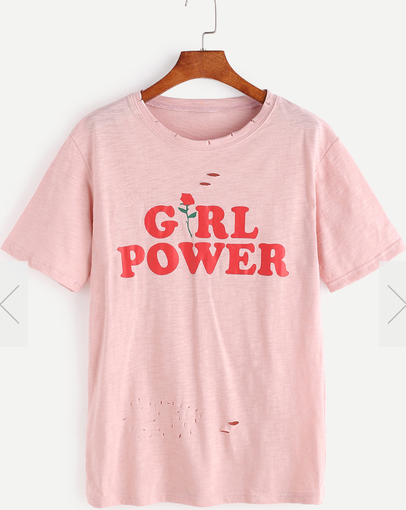 The highlights of my experience include the cami printed tank top and the girl power t-shirt. The fails were the light blue top (it falls off my shoulders!) and the striped set (the top does not fit me!). Have you ever ordered anything from online stores like Romwe before? What were your experiences like? Let me know so I can compare them to mine! Thanks again for stopping by Affordable by Amanda today. Romwe is my favorite store out of the ones like it. I've actually gotten my favorite top from there and the quality is amazing, I wear it all the time! The only thing I won't buy from those types of stores is shorts and jeans because the sizes are usually wacky lol.